Scientists and explorers will shortly set off on an expedition aiming to discover how Arctic sea ice melts. This year's Catlin Arctic Survey will focus on the thin layer of water immediately under the floating ice. Arctic ice is melting faster in summer than many computer models predict. Survey data could improve forecasts of the region's future, and also show how likely it is that the flow of warm water in the North Atlantic, known as the Gulf Stream, will switch off. This would bring colder weather to the UK and other parts of western Europe. "The Arctic is one of best barometers of climate change, where we see big changes taking place today," said Simon Boxall from the National Oceanography Centre (NOC) at the UK's University of Southampton. "This is not just about polar bears - it's about our lives in the UK and in North America." In early March, four explorers will set off on foot from the geographic North Pole, trekking across the ice and ending up 10 weeks later in Greenland. They will make regular stops to drill holes through the floating ice and lower a package of instruments into the water on the end of a piece of rope - instruments that measure the water's temperature, salinity and flow. This data will allow scientists to calculate the rate at which the water is sinking. "We're measuring the critical 200m layer of water between the ice and the deep ocean beneath," said Dr Boxall, who conceived the project. "The hypothesis has been that the layer stays there, trapped, acting to insulate the cold ice from the warm salty water below. "On the other hand, the water might be taken away more quickly - and that might accelerate the rate of Arctic melting." Even in the era of Earth observation satellites and automonous ocean floats, the old-fashioned approach - sending people across the ice to take readings by hand - is really the only one available for this kind of work, he noted. 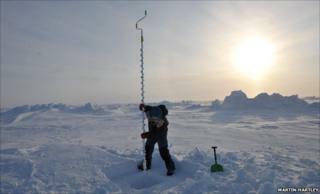 The findings could prove to be crucial in terms of projecting the future for Arctic sea ice. Both the area and volume of summer sea ice are steadily shrinking; and the last four summers have seen ice extent fall to sizes that a few years ago were being projected for the latter half of this century. If mixing in the crucial top ocean layer is happening more, that could help explain the trend and refine models, Dr Boxall said. The project could also improve forecasts on the climate of western Europe, and much further afield. The North Atlantic Drift (commonly called the Gulf Stream) brings warm water from the tropics into northern latitudes, where it gives up some of its heat to the air - keeping the UK and neighbouring countries warmer than their latitude alone would suggest. In colder regions north and west of the UK, winds whip water molecules from the sea, cooling it and making it more saline. In cold seasons, a layer of ice forms, which again adds to the water's salinity. The cold salty water sinks, and eventually returns southward deep in the ocean, forming part of the global thermohaline circulation (THC). As it sinks, it draws the warm surface waters northwards. Warmer and fresher water does not sink so readily; and this could could turn off the "ocean conveyor", a picture painted in heightened Hollywood colour in the movie The Day After Tomorrow. "Overall, if these changes... contribute to a lowering of the salt content of the North Atlantic, it could have a major impact on the entire planet - from significant temperature drops in Europe to intensified monsoons in Asia," said Richard Zimmerman, a bio-optics specialist at Old Dominion University in Norfolk, Virginia, US. "It may also impact weather patterns throughout North America, including a dramatic increase in the frequency and intensity of severe storms, including hurricanes and tornadoes across the eastern US." Recent work at NOC suggests it would be a quick change - if it happens. It would be likely to cool the UK's climate, with the sort of winter seen in the last three years becoming the norm. While the four explorers trek across the sea ice, scientists encamped on Ellef Ringnes Island off the north coast of Greenland will sample seawater and ice for coloured dissolved organic materials (CDOM), which affect the ocean's absorption of sunlight. "We'll be taking ice core sections and melting them, filtering and measuring particulates and the CDOM fraction within melted ice, and measuring algae," said Victoria Hill, also from Old Dominion University. Results from the season's work are expected to be ready for publication in science journals in the first half of next year. This is the Catlin Arctic Survey's third season, with ongoing projects focussing on ocean acidification - another consequence of having more CO2 in the atmosphere. The £1m project is directed by explorer Pen Hadow and sponsored by the Catlin insurance group.